GRID Alternatives Colorado installs rooftop, community, and multifamily solar electric systems for income qualified households and affordable housing providers throughout the state, providing families with needed savings and training Colorado workers for jobs in the growing solar industry. Learn more about our innovative community solar program. Be a part of the clean energy transition- become a client, volunteer or make a donation today! Your gift puts solar power and solar jobs where they are needed most. A rural, energy burdened town in Northern Colorado is now home to the state’s first floating solar array. We are thrilled to announce Adrienne Dorsey is the new Executive Director of GRID Colorado! 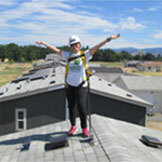 GRID volunteer, Kari Burman, unites her passions with GRID's mission as a skills-based volunteer.